9:10:00 PM P.s. got mine back from a friend and this is what i found out about it also tried to get a new one from a mission before that til i examined one. now she may have given me back a gaping spiderr queen in error will have to look into that to double check, but pretty sure it is accurate. 5:15:00 PM This pet is the only one that did any damage to the Gorax on Endor! 1:31:00 PM I LOVE my Gaping Spider Recluse! Very aggressive, fast, strong poison specials, and intimidating to look at. Im gonna keep this one! 1:59:00 PM In my opinion, infinitely better than it's counterpart, the gaping spider hunter, and it isn't all that hard to find either. 9:16:00 PM Spawn my first recluse mission, baby popped on first tap. Absolutely amazing pets, and not very hard to find. 9:26:00 AM I was able to tame one yesterday on Tempest. They spawn babies quite often. I took 2 Gaping Spider Recluse missions at Science Outpost that are about 600m apart. The main problem was those lairs were too close to Nightsister slaves and babies got killed by those about 5 times. But I just went back and forth between missions and finally tamed one. 4:17:00 PM cool pet, i love the spiders as a pet but i hate to fight them. Easiest way to get one of these is to join sologroup and take missions. Just beware of the poison! 2:43:00 PM Very nice pet. 3:30:00 AM Just wanted to thank everyone for the great info here. I pulled out my lvl 67 BE Rancor and easily found missions for the recluse lairs around 16.4k just as listed here. These things are NASTY... and I say that being a TKM, too. First lair, killed the two adults, tapped it, got a baby on the first tap, tamed it after a few tries. 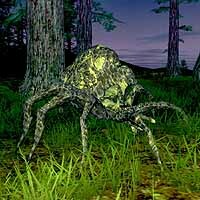 I hate spiders in real life and they give me the creeps, but I'll have one of these in game any day. I deleted my recently tamed gaping spider hunter for this... the specials are so much better. 10:30:00 PM Really, really nice pet. These guys seem to poison anything, and everything in their path. They're pretty much fearless, and rugged PVE tools. Very easy to come by, very nice to have.As a TKM, I can pull these missions grouped with two Giant anglers and a level 19 difficulty droid. I seem to get babies very regularly, with sometimes two babies spawning. Probably my favorite pet so far. 3:37:00 PM The 16k missions are correct. Had to beat the lair down 3 times last nite but did have success on a baby. Took me 4 times to tame...he/she even attacked me once. Take your time and don't give up. 11:38:00 PM I see a lot of these near the Imperial Prison and West or SouthWest of the Trade Outpost. 9:46:00 PM hello, i'm searching for one of these pets. I'm on the Ahazi server, Name: Noshisx, if you have one and want to get rid of it or sell it, i'll take it off you. 12:38:00 PM where exactly do you find these on dath? I have caught 2 queen gaping spiders but never seen a recluse adult. 1:15:00 AM Eeer...just noticed exactly the same as the hunters EXCEPT for the poison spray and the strong poison versus knockdown and med poison...EVEN BETTER!!! 1:13:00 AM These can actually be tamed from missions (about 12k) on Dath. I tamed 3 on one outing last night on Bria server. Very nice pet. Exactly like the gaping spider hunter but MUCH bigger! 4:58:00 PM I usually see them spawn from insect hills or wandering around alone. I believe they also spawn from Gaping Spider Lair that have a mixed bag, ie. Gaping Spiders, Gaping Spider Hunters, Gaping Spider Recluse, Gaping Spider Queen and so forth. 4:14:00 PM Do they spawn from gaping spider lairs? 8:45:00 PM Tamed a bay the other day, wow, what a great tank this is. Nice stats, doesnt run, worth having! 9:31:00 AM Just got 2 of these and they are sweet. about lvl 35 now and are good tanks already! 1:42:00 PM No you're correct. Poison Spray is an AE attack and a very effective one. I keep 2 of these as pets and they make very nice tanks. Very useful against social mobs and NPC's that like to use melee attacks. Opponents are pretty much guaranteed to be poisoned by this creature. You just need to be careful where you use them so you don't gain unecessary aggro from nearby mobs. And yes they're much larger than Gaping Spider Hunters. 8:48:00 PM ok, I'm guessing (corect me if I'm wrong) that poison spray is kinda like a CM's Area Poison attack. 7:51:00 AM Grows larger than standard gaping spiders.